Discussion in 'General Discussion' started by Mick West, Sep 17, 2015. Anti-immigration fears have been stoked by a story that a container of "plastic furniture" destined for Syrian refugees actually contained thousands of weapons and tons of ammunition. However the ship was actually sailing from Turkey (where most of the Syrian refugees are) to the Libyan city of Misrata, in Africa, and while the intended recipients are unclear, they were certainly not refugees. A weapons cargo possibly headed to Islamic State (Isis) militants in Libya has been seized by the Greek coastguard off Crete. Greek authorities said the shipment was intercepted in a coastguard special unit raid south-east of the Mediterranean island. Local media however reported the ship was sailing towards Libya when it was stopped, adding it is believed the weapons were intended for an IS local offshoot. The Turkish government however said the weapons were destined for the Sudanese police force, also claiming the shipment was fully documented. 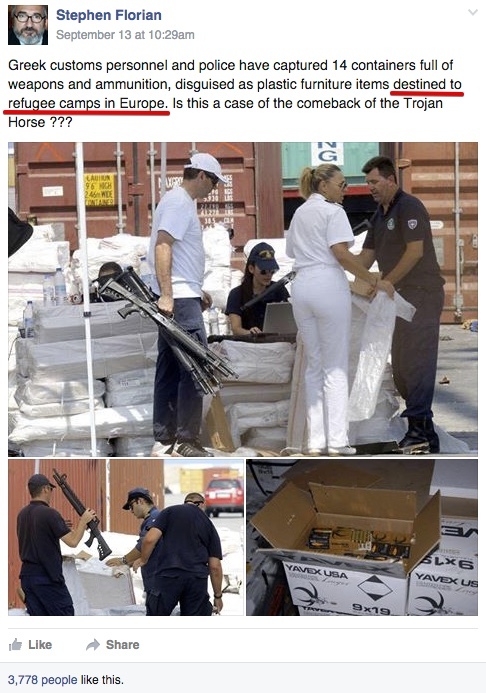 "If investigations by the Greek authorities show that the consignment is going to receivers other than those stated in the documentation, and if that is shared with us, naturally measures could be taken," foreign ministry spokesman Tanju Bilgic told Reuters. He added the vessel also carried building material for Libya, which is subject to a UN arms embargo.